Flossing can be a tedious task, let alone with braces to navigate. However, our Kirkwood MO orthodontist guarantees flossing with braces is well worth the time, as flossing regularly will decrease your risk of gum disease, cavities, and white spots upon removal. 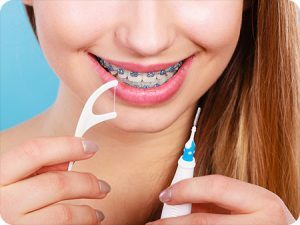 It may take some patience and require learning a few new tricks, but flossing with braces will be a breeze after reading these tips from our Kirkwood orthodontist. If you have braces, you know how frustrating it can be when something is stuck in brackets or wires! Wax floss will minimize the chances of your floss getting caught or snapping in a less than ideal spot. Using about 12-18 inches of floss will serve you best. You’ll want plenty of floss for each hand to easily grab and wrap around. Take the floss and thread it behind the main wire of your braces. If this process is challenging, purchasing a floss threader may be helpful. The tool allows you to thread the floss through the eye of what looks like a small, plastic sewing needle. By using the threader rather than your hands, maneuvering the floss behind the wire may prove to be much more effective and less frustrating. Once the floss is behind the wire, you can adjust it to the spaces between your teeth and begin to scrub gently. Be patient and gentle. It may not seem like you are accomplishing much, but beyond just food removal, flossing will keep less visible layers of plaque from building up. Congrats! You made it through your first set! Gently remove the floss and move on to the next area. Again, the process may seem time-consuming, but you will thank yourself for the investment in your 5-star smile soon. If wax floss is too irritating to your gums, dental tape can be a good option. Dental tape is thicker and more spongy than floss. The softer ribbon-like qualities will help to aid with heightened sensitivity. Additionally, if traditionally flossing with braces is too much of a chore, ask our Kirkwood orthodontist about a water flosser. The small, handheld device allows a stream of pressurized water to loosen and remove plaque. Both proxy and orthodontic brushes are also options to keep in mind if you feel you need extra help flossing. Intended to be used as a supplement to flossing, these brushes with uniquely shaped bristles can be obtained upon request from our Kirkwood orthodontic office. The information provided in this article is not meant to be medical advice and is for educational purposes only. If you would like to learn more about this and other topics related to orthodontics, feel free to contact Borello Orthodontics, with a convenient orthodontic office location near Kirkwood MO, by clicking here or by calling314.821.2400.